When it comes to work I'm very low maintenance. Working in a small office with little interaction with the outside world except the odd dash to the supermarket at lunch, has meant that make-up and hair is left in its natural state in favour of sleep. However there are some beauty items that a gal (I don't think I'm cool enough to use that word) just needs to have with her. Here I present to you my desk-side beauty. First up I have a hair clip which I got from Boots. On the odd day I wear my hair down, I find it just annoys me, so end up clipping it up. 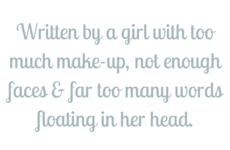 Perfect when you tend to spend a lot of the day with your head down typing. Also hair related I like to keep a little pocket brush (handy mirror there too) to give my hair a bit of a spruce up, which it often needs. Finally if I really should've washed my hair the night before, or on the off chance I'm going out after work I like to keep some dry shampoo handy, just in case. For me, a broken nail is the most annoying thing. As someone who used to bite their nails seeing the start of a broken nail is just too tempting, so I like to file it down before I create some real damage. I also find that sometimes I don't realise my nails are a bit too long until I'm trying to type and file them down a little. Also in the name of hand care I love this Garnier hand cream and tend to use it daily. Washing up my cups and dishes can leave my hands feeling dry, especially in the winter weather and this is great at making them feel softer. Finally to keep chapped lips at bay I like to keep a lip balm with me. This Nivea one has little colour but serious moisture, making it the perfect desk-side beauty item. It's great to slap on without a mirror and really works at nourishing my lips as I work. 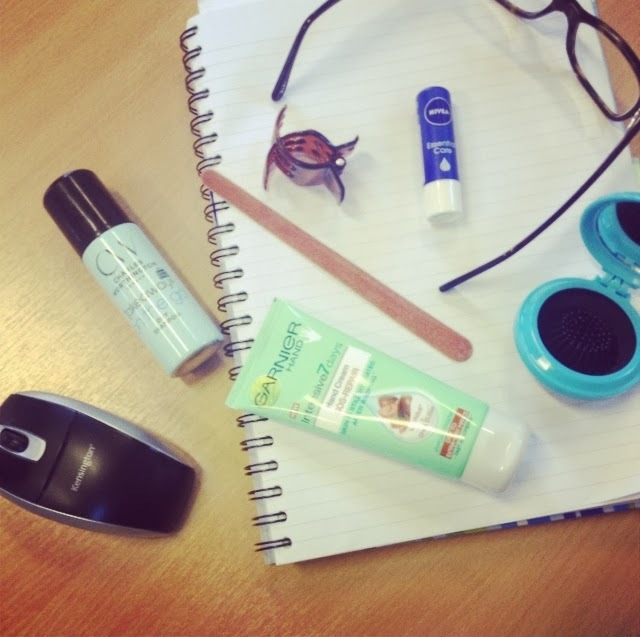 What are your desk side beauty picks?